Fluorescence Lifetime Imaging Microscopy or FLIM is an imaging technique for producing an image based on the differences in the exponential decay rate of the fluorescence from a fluorescent specimen. FLIM is in particular useful as an imaging tool to be used on molecules in living cells. There are a number of parameters that have an influence on the fluorescence lifetime of a probe or label. Such factors are for example ion concentrations, oxygen concentration, and the environment of a fluorescent probe or label. Unlike fluorescence intensity, fluorescence lifetime is to some extent independent of the fluorophore concentration, photo-bleaching, light scattering and fluctuations of the excitation light intensity. Therefore fluorescence lifetime is a more robust read out parameter and enables less artifact prone measurements of analytes and FRET analysis. SETA BioMedicals has developed several fluorescent probes and labels that are suitable for lifetime-based imaging applications. Some of these have longer lifetimes up to 31 ns. 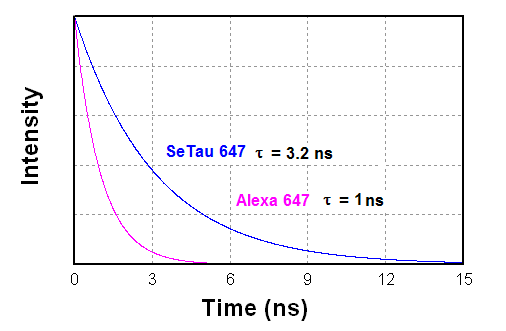 Time-domain FLIM - In the time domain the sample is excited with a short laser pulse with a few hundred picosecond pulse duration and the time between the pulse and the arrival of the photon at the PMT is measured. This process is repeated for a large number of photons and a time-pin histogram is generated which is then fitted with an exponential decay function to give the lifetime of the measured luminescent compound. Fluorescence lifetime images are typically expressed in a pseudo-color according to their lifetimes. 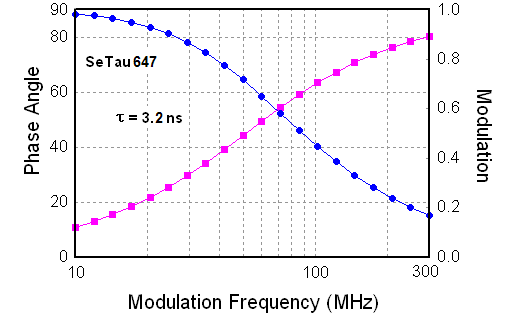 Frequency-domain FLIM – In frequency domain the excitation light is sinusoidally modulated at a specific frequency and the fluorescence lifetime is calculated from the phase shift or demodulation of the emitted light compared to the excitation light. Due to the non-zero lifetime of the fluorescent species, the emitted fluorescence light is phase-shifted and demodulated compared to the excitation light. Since the fluorescence lifetime of a fluorophore depends on both, the radiative and non-radiative rates, energy transfer from the donor molecule to the acceptor molecule will decrease the lifetime of the donor. FRET can be used to generate lifetime changes that are then measured pixel by pixel to provide the FLIM image. If you consider using FRET in combination with FLIM in your application we refer you to FRET applications, where we offer a series of FRET pairs with Förster distances from 40 – 80 Angstrom. Should you require a specific FRET pair that is not on the list please contact us. FLT labels with long lifetimes up to 32 ns are listed under FLT labels. Squaraine-rotaxanes are extremely bright, photostable and have several ns lifetimes and are therefore well-suited for FLIM measurements. SeTau-647 (SeTau-647-NHS and SeTau-647-Maleimide) is the brightest dye currently on the market for the Kr-ion laser. It combines an extremely high quantum yield of 60% with an extinction coefficient of 200,000 [M-1cm-1]. Some FRET combinations of these dyes with Seta or SQ dyes as acceptors yield FRET pairs with Förster distances up to 80 Angstrom. SeTau-633-Ethyl-Ester is hydrophobic in nature and therefore passively penetrates the cell membranes. Once inside the cell the ethyl ester modified probes are hydrolyzed by esterases thereby forming carboxyl groups that are cell-impermeable. These probe can be structurally modified for targeting of different cellular locations for in vitro and in vivo optical imaging of live and fixed cells. Images stained with some of these probes are stable for hundreds of hours. For more specific information we refer you to B.Smith et al., Angew. Chem. 2007, 119, 5624-5627. See also Fluorescence Imaging and NIR Fluorescence Imaging.